Perform fast, accurate and reliable elemental analysis of solid metal samples from trace to percent level with the Thermo Scientific™ ARL™ easySpark™ Metal Analyzer. This new benchtop optical emission spectrometry (OES) instrument is specially designed for foundries and metal processors who need advanced metal analysis to produce parts for automotive, aviation, aerospace, consumer products, and other industries. Easy to install, use, and maintain, the ARL easySpark analyzer is accessible to non-experts in OES who require efficiency and productivity in metal and alloy production. 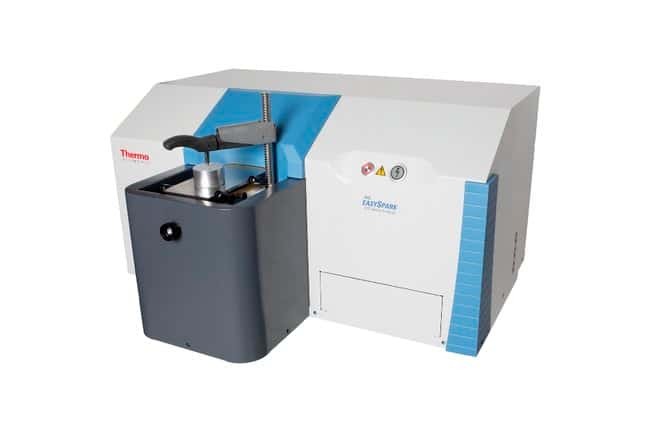 The ARL easySpark metal analyzer is designed to meet the challenges and demands of small-to medium-sized plants and laboratories in the metal industry that require high-quality, yet cost-effective OES analysis to produce parts for automotive, aviation, aerospace and consumer products, among other industries. The instrument features a unique multi-grating/CCD (charge-coupled device)-based optical system that delivers a high level of resolution. The ability to accurately analyze all elements from trace to percentage level in any solid metal sample. Revolutionary spark source and optic design for best performance in its category. Intuitive easy Thermo Scientific™ OXSAS analysis software for a fast learning curve and easy routine operations. A robust and reliable construction that requires minimal maintenance. Compliance with safety standards and quality regulations. Simple design accessible to novice production operators and skilled laboratory staff alike. Well suited for additional markets including metals recycling, academic and non-academic laboratories, and primary metals producers looking for an economic solution to analyze their metal products and materials for quality and process control or for a back-up instrument.